The 7405 E & H Near Field Probe Set consists of three loop probes, one stub and one ball probe, an extension handle, an optional battery-powered preamplifier, and a foam-lined carrying case with a manual and application note. The handle of each probe terminates in a BNC connector. 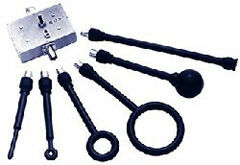 Probes are designed to be used with a signal analyzing device such as an oscilloscope or spectrum analyzer. The optional preamplifier is useful when signal amplification is necessary for the analyzing device.